Following the news from 20th Century Fox that the Rise of the Planet of the Apes sequel, appropriately and wordily titled Dawn of the Planet of the Apes, would arrive on May 23rd, 2014, the franchise prequel director Rupert Wyatt left the production. Thankfully, Matt Reeves (Let Me In, Cloverfield) has stepped up to take over directing duties and keep the production on track to meet the proposed release date in a year and a half. Now the film's official Facebook page has released some kind of odd teaser image for the sequel (though it's actually fan-made), and it looks like we may be seeing some pretty apes with guns soon enough. 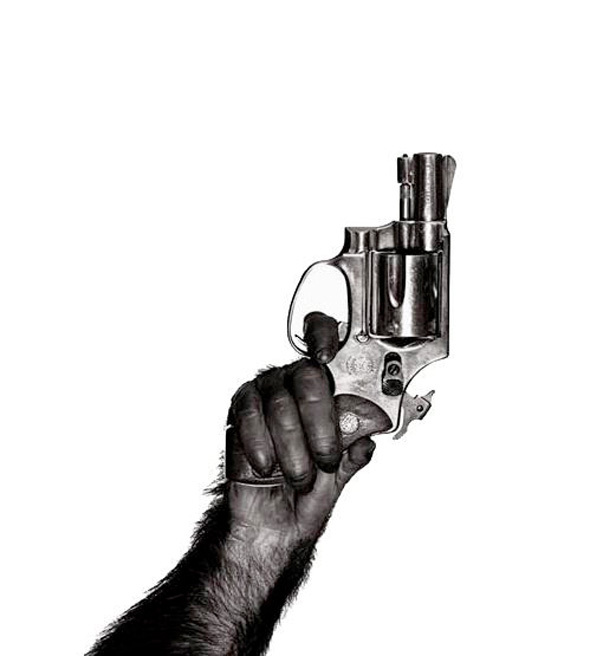 Update: This image is not actually an official studio promo, but is rather Albert Watson's photograph titled "Monkey With Gun" first debuted in 1992. Original image (via @russfischer) can be found officially here. Dawn of the Planet of the Apes will be directed by Matt Reeves (Let Me In, Cloverfield) and written by Scott Z. Burns (Contagion, The Bourne Ultimatum), Mark Bomback (The Wolverine, Live Free or Die Hard) and Rick Jaffa & Amanda Silver (Rise of the Planet of the Apes). No plot details have been revealed yet, but following the events of the first film, the sequel will see the advancement of the intelligent apes that revolted against humans in San Francisco. Andy Seriks is reprising his motion-capture work from the first film as the ape Caesar and 20th Century Fox sends the film to theaters on May 23rd, 2014. Stay tuned for more info. I like the concept but that looks way too cheap. The ape hand looks like part of a costume. Nice one. I bet Alex likes this more than the original poster.